"GRINDEX" provides support to it’s customers in all phases of operating and exploiting of our machine. 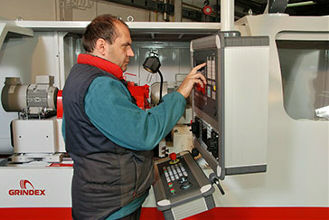 Before the delivery of the grinding machine we offer the full user training for operating the machine. In the later stages we provide the first necessary information and technical assistance by phone and other means of electronic communication for the problem solution. If it is not possible to solve the problem according to our instructions given by the phone or other means of electronic communication, our technicians will come to buyer’s facilities and solve the problem in no longer then 48 hours.